An early career in health care led to political aspirations for Eddie Bernice Johnson, culminating in her current position representing Texas in the U.S. House of Representatives. She is an advocate for women, children, and human rights. Born in Waco, Texas, in 1935 to parents Lee Edward Johnson and Lillie Mae (White) Johnson, Bernice Johnson traveled to Indiana to attend college when there were no educational opportunities for her as a black woman in Texas. She earned a diploma in nursing from St. Mary’s College of Notre Dame in 1955. One year later she married Lacey Kirk Johnson. The couple had one son, Kirk, and then divorced in 1970. Bernice Johnson continued her education. She later received a BS in nursing from Texas Christian University in 1967 and a MS in public administration in 1976 from Southern Methodist University. Johnson was the chief psychiatric nurse at the Dallas Veterans Administration Hospital until 1972 when she was elected to the Texas House of Representatives, the first African American woman ever elected to public office from Dallas. She also became the first woman in Texas history to lead a major Texas House committee when she chaired the Labor Committee. Five years later, President Jimmy Carter appointed her to be the regional director for the Department of Health, Education, and Welfare. When Carter left office in 1980, Johnson entered the private sector as a business development consultant in Dallas. In 1986, she re-entered politics and was elected as a Texas state senator who advocated for fair housing, minority-owned businesses, and health care services. The 1990 census created new congressional districts for Dallas, and Johnson served on the reapportionment committee. Her involvement with the redistricting created controversy when she ran for one of the new seats, but in 1992 she was elected to the U.S. House of Representatives. As a House member, she has served on the Transportation and Infrastructure Committee as well as the Committee on Science and Technology. She also began “A World of Women for World Peace,” a forum to bring greater visibility to the women who are victims of war. She was also an early supporter of the North American Free Trade Agreement (NAFTA) recognizing that the treaty would promote Dallas-area business with Mexico. Johnson served as chair of the Congressional Black Caucus (CBC) from 2001 to 2003 where she was noted for her attempts to build coalitions with business groups in addition to its traditional allies, labor unions and civil rights organizations. "Eddie Bernice Johnson" in Black Americans in Congress, 1870-1907 (Washington, D.C.: U.S. Government Printing Office, 2008); L. Mpho Mabunda, ed., Contemporary Black Biography, Vol. 8, “Eddie Bernice Johnson,” (Detroit, MI: Gale Research, 1995); “Congresswoman Eddie Bernice Johnson, Representing the 30th District of Texas,” https://ebjohnson.house.gov/. (Washington, D.C.: U.S. Government Printing Office, 2008); L. Mpho Mabunda, ed., Contemporary Black Biography, Vol. 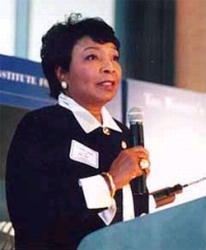 8, “Eddie Bernice Johnson,” (Detroit, MI: Gale Research, 1995); “Congresswoman Eddie Bernice Johnson, Representing the 30th District of Texas,” http://ebjohnson.house.gov/index.html.